The plants in my back garden are really coming along very nicely. It gives me so much pleasure now to go and spend time there. Even the lawn is coming along, despite all the shade. I thought I would slowly start photographing the individual plants I have in my garden and explain why they were chosen. As you can see on these two photos, the ground cover we are using here is Lamium “beacon silver” and Plectranthus madagascariensis. I really love how fresh and attractive the Lamium looks, especially in contrast with the foliage of the darker green plants. 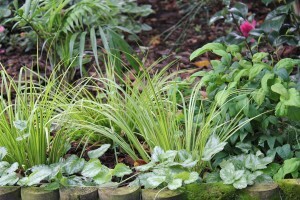 It has light green variegated leaves with white / very light green. It is excellent as a filler plant in shaded areas and it looks particularly attractive in the back garden against the darker green leaves of the Camellias and Plectranthus ‘Mona Lavender’. 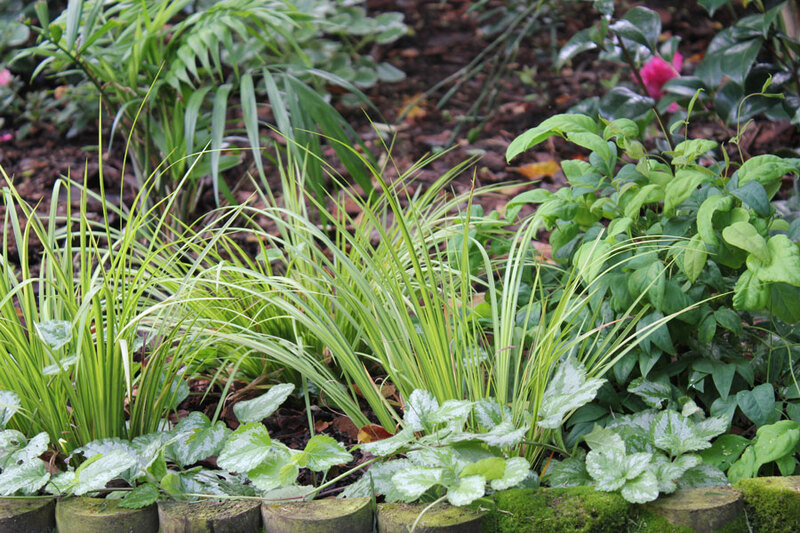 I’m really loving this plant … I think its my new favourite ground cover. It needs to be controlled a bit, but is not as invasive as other ground covers I’ve known and responds beautifully to being nipped back, growing bushy and quickly! So far, its been totally pest free in my garden. Then you see the Acorus gramineus ‘Variegata’ right behind / amongst the Lamium. 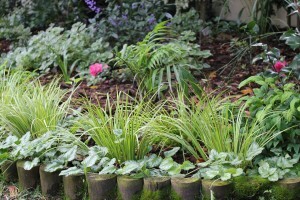 A great choice for a spiky texture in a mixed bed like this, I love these too. Also variegated, they apparently do produce little inconspicuous flowers (I haven’t seen any yet), but they are grown primarily for their attractive foliage. They too are pest free (so far), growing fairly quickly and giving me lots of pleasure! Oh wow! It is looking so amazing! I also love the different textures together. Very, very pretty! This is when gardening becomes a rewarding hobby! When your plants are happy and thriving!